After a slight hiatus - no pictures for January and February 1980 - I have to return south for March's picture. The location is Parkend, in the Forest of Dean, Gloucestershire. 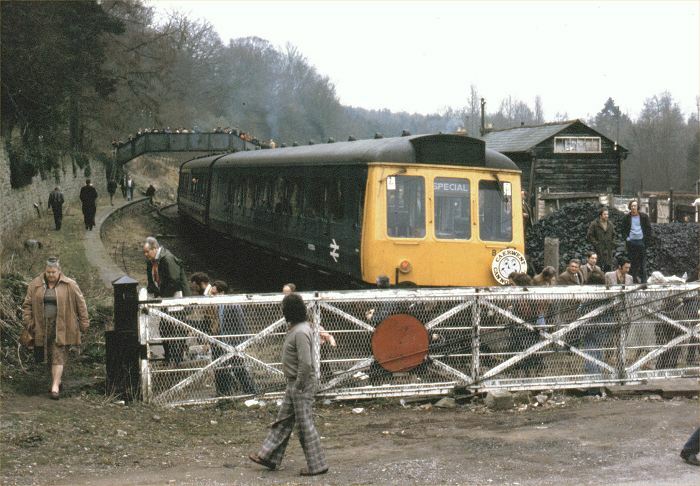 The train is the "Caerwent Cannonball", run on the 15th March 1980 to various freight branches in South Wales and Gloucestershire, and jointly organised by the RCTS and the Monmouthshire Railway Society. The final line covered was the branch from Lydney to Parkend. The line had been retained for stone ballast traffic from nearby quarries, but this was possibly the last working on the line. The train is formed of 2 3-car Bristol-based DMU sets. Following closure by BR, the line was purchased by the Dean Forest Railway Co and has been reopened in phases. The final section from Whitecroft to Parkend is due to open this year.